HALLOWEEN MONTH IS HERE! In addition to all my usual blog posts I will also be throwing in my looks at forgotten or neglected works of horror – either novels, movies, television shows, even operas (yes, operas). To kick off this fun month at Balladeer’s Blog here is my look at three seriously neglected Gothic horror novels of the late 1700s and the 1800s. Everybody remembers the big names like Dracula and Frankenstein but I want to introduce readers to some forgotten gems of Gothic horror. 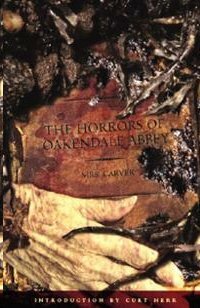 THE HORRORS OF OAKENDALE ABBEY (1797) – The author of this unjustly forgotten work is known only as “Mrs Carver” but is often speculated to be a man with the leading candidate being Sir Anthony Carlisle. The tale centers around the beautiful (of course) and strong-willed (ditto) Laura, a refugee from the Reign of Terror following the French Revolution. When Laura is reluctant to accomodate the less-than-selfless motives of her British patron Lord Oakendale he has her and a devoted maid banished to the long-abandoned Oakendale Abbey. The Abbey is believed to be haunted, a reputation enhanced by the repeated disappearances of people who venture into its sinister interior. Shortly after arriving in the mysterious decaying building Laura discovers a skeleton in a trunk – a skeleton which may be the remains of a male admirer done away with by the jealous Lord Oakendale. The courageous Laura continues her investigation into the Abbey’s secrets despite the pleas of her terror-stricken maid and the other household staff who report to the place on a daily basis. An order of secretive monks is using Oakendale Abbey to conduct their odd and very gruesome experiments on human corpses. But to what end? The story doesn’t hide from grotesque details that Clive Barker would be proud of. VARNEY THE VAMPIRE (1845-1847) – Subtitled The Feast of Blood, this work was published in serialized form from 1845-1847 and then finally in book form in 1847. The story ran to 220 (!) chapters and bears a resemblance to much later pulp fiction especially in the way in which the longer the story ran the more the current chapters often contradicted or outrightly ignored the earlier installments. Entire characters disappear as the chapters pile up and the many hints about Varney’s true identity are never resolved. 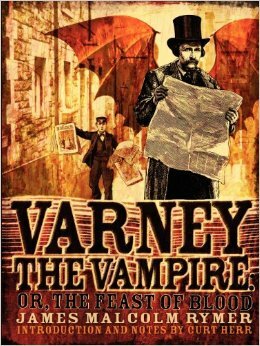 Despite all that, Varney the Vampire is an irresistable read. Its influence on Bram Stoker and Sheridan Le Fanu is obvious and there’s a thematic strength to the work despite its meandering plot which is really more a piling-on of events and not an organized arc. Perfect for readers from this television age! Varney moves about in daylight just fine and is immune to crucifixes and garlic, a side-effect of his multiple deaths and resurrections it turns out. One of those resurrections is based more on the pseudo-science of his mad scientist savior Dr Chillingworth rather than pure vampire lore. Sir Francis Varney is a vampire who despises his horrific condition and his unholy appetites. He wages war on the Bannerworth family and may really be their ancestor Marmaduke Bannerworth aka Sir Runnagate Bannerworth. Later the tormented fiend feuds with another family, the Croftons, and spreads his vampiric curse to Clara Crofton as an act of spite. Summing up the plot of this tale would be like offering up a brief summary of a long-running series like Lost or The X-Files, but the lengthy story is worth a read. Try to look past the silly-sounding title Varney the Vampire. What’s next? Wagner the Werewolf? WAGNER THE WEREWOLF (1847) Yep. 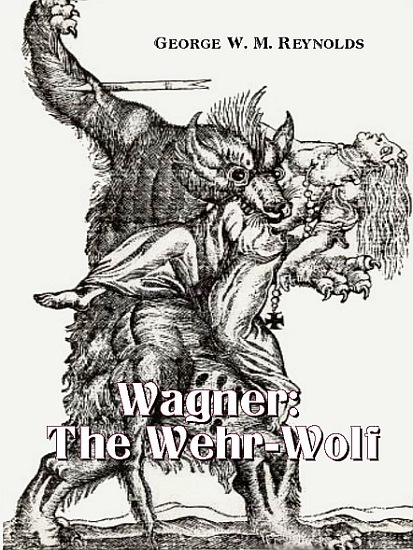 Wagner the Wehr-Wolf to give the novel its original spelling. Written by George W.M. Reynolds this is the tale of a man cursed with lycanthropy in 1500s Germany. The title character is Fernand Wagner, a man who gains youth and wealth in a bargain with Herr Doktor Faust, but the price is a curse that transforms him into a werewolf on the final night of each month. Wagner passes himself off as his own descendant to avoid probing questions about his new youthful appearance.The novel deals with Wagner returning home just in time to interact at a crucial moment with his own family and an aristocratic family whose sagas have forever intertwined. Amid the soap-opera antics that Gothic horror often bogs down in we also get treated to evil nuns who torture their convent novices, Christian Rosenkreuz and his Rosicrucians, angels from Heaven, demented clerics of the Inquisition and much more. There is a memorable sequence where Wagner is transforming into a werewolf while being pursued by a pack of dogs. The tale takes place over the course of a year and a half so a lot of space is wasted on side stories and clashes between the Christians and Muslims in eastern Europe. Wagner’s adventures are not as much fun as Varney’s and this novel often gets lost in the stories of the supporting characters. Still, the crossover with Faust and Rosenkreuz lends the story a certain Monster Rally charm and it’s worth reading if you skip over entire chapters that deal with irrelevancies. The Varney and Wagner thing made me laugh! I comment once i like a post on a internet site or if I have something to add towards the conversation. Usually it can be a result in the passion communicated in the submit I browsed. And after this write-up Audi A6 3.0 TDI quattro Consumption and Costs | Cars Show. I was basically moved enough to article a leave a responsea response I do possess a couple of questions for you if it’s okay. Could it be just me or does it appear like like a few from the remarks search as whenever they are written by brain dead folks? And, if you are writing on additional places, I’d like to keep up along with you. Would you produce a list the complete urls within your manifeste pages like your linkedin profile, Facebook webpage or twitter feed? Awesome! Never heard of these books before now.